Ian Chapman is positive going into Burgess Hill Town’s Bostik Premier opener against Potters Bar (3pm kick off, Green Elephants Stadium) - but knows his side must improve this season. Chapman has not set any targets, other than improvement on the pitch. The Hillians have had three years of surviving the drop on the last day. But Chapman believes his side have the quality to do well and and says there is a different feeling around the club. Chapman said: “The chairman hasn’t got to tell - I know we have to see an improvement. If I feeI I can’t improve the football club then it’s pointless me being here. “For me this season it’s about getting better and we must see improvement. I don’t walk away from it and forget about it. If we lose on a weekend or midweek, I get the hump for two or three days before the next game. But that’s part of it. “We must improve this season and I do believe with the players we have got we will. Chapman’s men have had an indifferent pre-season results-wise, but Chapman is pleased with how it has gone. “I am really pleased with pre-season. Results have been indifferent but that’s not an issue. 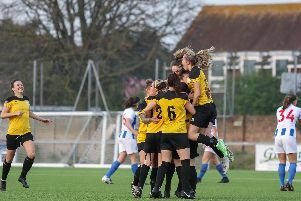 “We went to Haywards Heath and probably had eight players who wouldn’t be playing at the start of the season, so that was a good work out. And with more local sides in the league this year after the restructure, Chapman believes this will benefit his side. He said: “In the past it’s been difficult logistically of where we are, but now we can can get people to watch the opposition because there are more local teams. Chapman doesn’t know too much about Potters Bar but had a conversation with someone who played them in pre-season. The boss also knows ten of his starting line-up but is waiting until training on Thursday to finalise his side. Tariq Richards has suffered from shin splints but should be ok for Saturday, Sam Fisk has not played with the first team in pre-season due to unavailability and Charlie Bennett has a slight ankle injury but all will be involved in the squad on Saturday.